I have a policy of keeping overheads to a bare minimum, building up a mailing base, asking car clubs to give me a mention in their newsletters, and relying on word-of-mouth recommendations, to enable me to provide high quality events at affordable rates. Tours to Scandinavia, Croatia, Italy, Ireland and Switzerland have all been a great success and the format of generally low daily mileage and mostly two night halts has proved a hit with people wishing to enjoy relaxing tours ‘with a difference’. Register for over forty years, and for thirty-two of those years arranged their annual Welsh weekend rally. In addition I have toured extensively in classic cars throughout Europe, possess a 1938 single seater-racing car, and also compete on historic rallies (Monte Carlo, Le Jog, Circuit of Ireland Retro, etc.). However, as stated above, the aim of my touring events is to provide unusual, interesting, and leisurely sight-seeing holidays for people who enjoy using their pride and joy, but do not wish to stress machinery or passengers. There is absolutely no competition, apart from getting to the hotel bar first! 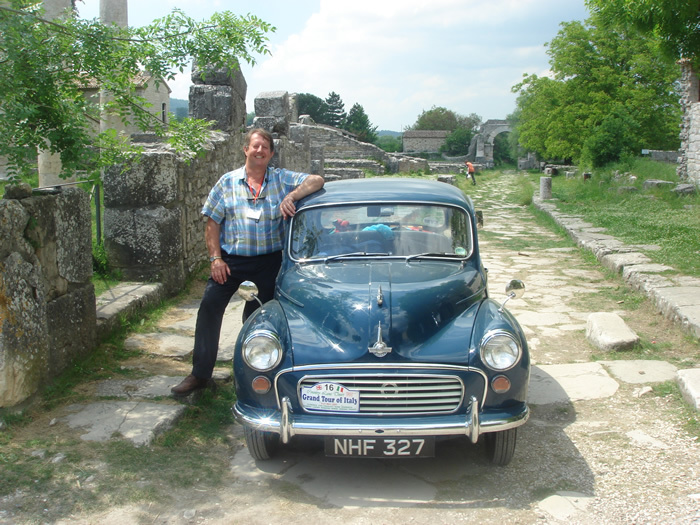 All routes are personally reconnoitred by me in a classic car (1963 Morris Minor or 1951 Marauder), and hotels checked to ensure a good standard – it’s a tough job, but somebody has to do it! Detailed, easy-to-read, road books are provided, and I’m always on hand to deal with any minor problems, should they occur. Certain tours also have a service vehicle crewed by an experienced mechanic in attendance.